Finnish ( suomi (help·info), or suomen kieli [ˈsuo̯men ˈkie̯li] ) is a Finnic language spoken by the majority of the population in Finland and by ethnic Finns outside Finland. Finnish is one of the two official languages of Finland (the other being the Swedish language); Finnish is also an official minority language in Sweden. In Sweden, both Standard Finnish and Meänkieli, a Finnish dialect, are spoken. The Kven language, a dialect of Finnish, is spoken in Northern Norway by a minority group of Finnish descent. 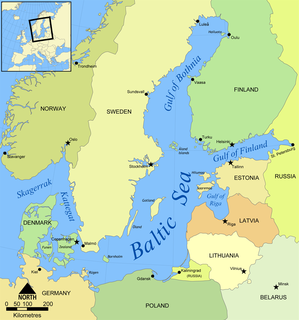 The Finnic languages (Fennic), or Baltic Finnic languages, are a branch of the Uralic language family spoken around the Baltic Sea by Finnic peoples, mainly in Finland and Estonia, by about 7 million people. Morphological typology is a way of classifying the languages of the world that groups languages according to their common morphological structures. The field organizes languages on the basis of how those languages form words by combining morphemes. Analytic languages contain very little inflection, instead relying on features like word order and auxiliary words to convey meaning. Synthetic languages, ones that are not analytic, are divided into two categories: agglutinative and fusional languages. Agglutinative languages rely primarily on discrete particles for inflection, while fusional languages "fuse" inflectional categories together, often allowing one word ending to contain several categories, such that the original root can be difficult to extract. A further subcategory of agglutinative languages are polysynthetic languages, which take agglutination to a higher level by constructing entire sentences, including nouns, as one word. Fusional languages or inflected languages are a type of synthetic language, distinguished from agglutinative languages by their tendency to use a single inflectional morpheme to denote multiple grammatical, syntactic, or semantic features. For example, the Spanish verb comer has the first-person singular preterite tense form comí ; the single suffix -í represents both the features of first-person singular agreement and preterite tense, instead of having a separate affix for each feature. The essive case, or similaris case is one example of a grammatical case, an inflectional morphological process by which a form is altered or marked to indicate its grammatical function. The essive case on a noun can express it as a definite period of time during which something happens or during which a continuous action was completed. It can also denote a form as a temporary location, state of being, or character in which the subject was at a given time. The latter meaning is often referred to as the equivalent of the English phrase "as a ___". The locative case is a grammatical case which indicates a location. It corresponds vaguely to the English prepositions "in", "on", "at", and "by". The locative case belongs to the general local cases together with the lative and separative case. In linguistics, a causative is a valency-increasing operation that indicates that a subject either causes someone or something else to do or be something or causes a change in state of a non-volitional event. Prototypically, it brings in a new argument, A, into a transitive clause, with the original S becoming the O. In grammar, the genitive case, also called the second case, is the grammatical case that marks a word, usually a noun, as modifying another word, also usually a noun—thus, indicating an attributive relationship of one noun to the other noun. A genitive can also serve purposes indicating other relationships. For example, some verbs may feature arguments in the genitive case; and the genitive case may also have adverbial uses. The partitive case is a grammatical case which denotes "partialness", "without result", or "without specific identity". It is also used in contexts where a subgroup is selected from a larger group, or with numbers. The ablative case is a grammatical case for nouns, pronouns and adjectives in the grammar of various languages; it is sometimes used to express motion away from something, among other uses. The word "ablative" derives from the Latin ablatus, the (irregular) perfect passive participle of auferre "to carry away". There is no ablative case in modern Germanic languages such as German, nor in ancient Greek. The most important contributions to improving the status of Finnish were made by Elias Lönnrot. His impact on the development of modern vocabulary in Finnish was particularly important. In addition to compiling the Kalevala , he acted as an arbiter in disputes about the development of standard Finnish between the proponents of western and eastern dialects, ensuring that the western dialects Agricola had preferred preserved their preeminent role, while many originally dialect words from Eastern Finland were introduced to the standard language, enriching it considerably. 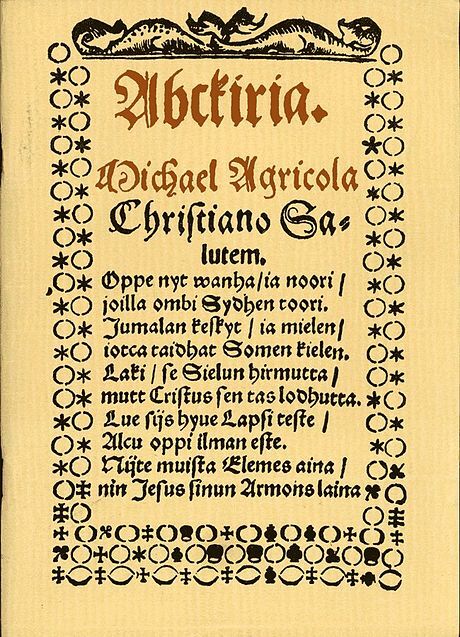 The first novel written in Finnish (and by a Finnish speaker) was Seven Brothers (Seitsemän veljestä), published by Aleksis Kivi in 1870. The Finnish language has been changing in certain ways after World War II, as observed in the spreading of certain dialectal features (for example the spread of Western allophone of the cluster ts (mettä: mettän/metän (forest: forest's) instead of metsä) and the Eastern disappearance of d-sound (tiän/tiij(j)än ((i) know)) instead of the Western allophones) and the simultaneous preference to abandon the more visible dialectal features. Some scientists[ who? ] have also reported the moving of the ä-sound towards the a-sound, even theorising that the Finnish speakers would start to pronounce the a-sound even more distantly from the changing ä-sound in order to preserve vowel harmony. The dialects of Finnish are divided into two distinct groups, Western and Eastern. The dialects are almost entirely mutually intelligible and are distinguished from each other by only minor changes in vowels, diphthongs and rhythm. For the most part, the dialects operate on the same phonology, grammar and vocabulary. There are only marginal examples of sounds or grammatical constructions specific to some dialect and not found in standard Finnish. Two examples are the voiced dental fricative found in the Rauma dialect, and the Eastern exessive case. Standard Finnish is prescribed by the Language Office of the Research Institute for the Languages of Finland and is the language used in official communication. The Dictionary of Contemporary Finnish (Nykysuomen sanakirja 1951–61), with 201,000 entries, was a prescriptive dictionary that defined official language. An additional volume for words of foreign origin (Nykysuomen sivistyssanakirja, 30,000 entries) was published in 1991. An updated dictionary, The New Dictionary of Modern Finnish (Kielitoimiston sanakirja) was published in an electronic form in 2004 and in print in 2006. A descriptive grammar ( Iso suomen kielioppi ,  1,600 pages) was published in 2004. There is also an etymological dictionary, Suomen sanojen alkuperä, published in 1992–2000, and a handbook of contemporary language (Nykysuomen käsikirja), and a periodic publication, Kielikello. Standard Finnish is used in official texts and is the form of language taught in schools. Its spoken form is used in political speech, newscasts, in courts, and in other formal situations. Nearly all publishing and printed works are in standard Finnish. A prominent example of the effect of the standard language is the development of the consonant gradation form /ts : ts/ as in metsä : metsän, as this pattern was originally (1940) found natively only in the dialects of the southern Karelian isthmus and Ingria. It has been reinforced by the spelling 'ts' for the dental fricative [θː], used earlier in some western dialects. The spelling and the pronunciation this encourages however approximate the original pronunciation, still reflected in e.g. Karelian /čč : č/ (meččä : mečän). In the spoken language, a fusion of Western /tt : tt/ (mettä : mettän) and Eastern /ht : t/ (mehtä : metän) has resulted: /tt : t/ (mettä : metän). It is notable that neither of these forms are identifiable as, or originate from, a specific dialect. ↑ The short velar nasal is an allophone of /n/ in /nk/, and the long velar nasal /ŋŋ/, written ng, is the equivalent of /nk/ under weakening consonant gradation (type of lenition) and thus occurs only medially, e.g. Helsinki – Helsingin kaupunki (city of Helsinki) /hɛlsiŋki – hɛlsiŋŋin/. ↑ /d/ is the equivalent of /t/ under weakening consonant gradation, and thus in inherited vocabulary occurs only medially; it can actually, especially when spoken by older people, be more of an alveolar tap rather than a true voiced stop, and the dialectal realization varies widely; see the main article on Finnish phonology. ↑ The glottal stop can only appear at word boundaries as a result of certain sandhi phenomena, and it is not indicated in spelling: e.g. /annaʔolla/ 'let it be', orthographically anna olla. Moreover, this sound is not used in all dialects. Finnish is somewhat divergent from other Uralic languages in two respects: it has lost most fricatives, as well as losing the distinction between palatalized and non-palatalized consonants. Finnish has only two fricatives in native words, namely /s/ and /h/. All other fricatives are recognized as foreign, of which Finnish speakers can usually reliably distinguish /f/ and /ʃ/. (The official alphabet includes 'z' [z] and 'ž' [ʒ], but these are rarely used correctly, including by the Swedish-speakers, who also struggle with those sounds.) While standard Finnish has lost palatalization, which is characteristic of Uralic languages, the Eastern dialects and the Karelian language have redeveloped or retained it. For example, the Karelian word d'uuri[dʲuːri], with a palatalized /dʲ/, is reflected by juuri in Finnish and Savo dialect vesj[vesʲ] is vesi in standard Finnish. The main stress is always on the first syllable, and it is articulated by adding approximately 100 ms more length to the stressed vowel. Stress does not cause any measurable modifications in vowel quality (very much unlike English). However, stress is not strong and words appear evenly stressed. In some cases, stress is so weak that the highest points of volume, pitch and other indicators of "articulation intensity" are not on the first syllable, although native speakers recognize the first syllable as a stressed syllable. Consonant gradation is a partly nonproductive  lenition process for P, T and K in inherited vocabulary, with the oblique stem "weakened" from the nominative stem, or vice versa. For example, tarkka "precise" has the oblique stem tarka-, as in tarkan "of the precise". There is also another gradation pattern, which is older, and causes simple elision of T and K in suffixes. However, it is very common since it is found in the partitive case marker: if V is a single vowel, V+ta → Va, e.g. *tarkka+ta → tarkkaa. Over the course of many centuries, the Finnish language has borrowed many words from a wide variety of languages, most from neighbouring Indo-European languages. Indeed, some estimates put the core Proto-Uralic vocabulary surviving in Finnish at only around 300 word roots. [ citation needed ] Owing to the different grammatical, phonological and phonotactic structure of the Finnish language, loanwords from Indo-European have been assimilated. In general, the first loan words into Uralic languages seem to come from very early Indo-European languages. Later important sources have been, depending on the language, Indo-Iranian, Turkic, Baltic, Germanic, and Slavic languages. Finnic languages, including Finnish, have borrowed in particular from Baltic and Germanic languages, and to a lesser extent from Slavic and Indo-Iranian languages. Furthermore, a certain group of very basic and neutral words exists in Finnish and other Finnic languages that are absent from other Uralic languages, but without a recognizable etymology from any known language. These words are usually regarded[ who? ] as the last remnant of the Paleo-European language spoken in Fennoscandia before the arrival of the proto-Finnic language. [ citation needed ] Words included in this group are e.g. jänis (hare), musta (black), mäki (hill), saari (island), suo (swamp) and niemi (cape (geography)). Often quoted loan examples are kuningas "king" and ruhtinas "sovereign prince, high ranking nobleman" from Germanic *kuningaz and *druhtinaz—they display a remarkable tendency towards phonological conservation within the language. Another example is äiti "mother", from Gothic aiþei, which is interesting because borrowing of close-kinship vocabulary is a rare phenomenon. The original Finnish emo occurs only in restricted contexts. There are other close-kinship words that are loaned from Baltic and Germanic languages (morsian "bride", armas "dear", huora "whore"). Examples of the ancient Iranian loans are vasara "hammer" from Avestan vadžra, vajra and orja "slave" from arya , airya "man" (the latter probably via similar circumstances as slave from Slav in many European languages[ citation needed ]). Especially words dealing with administrative or modern culture came to Finnish from Swedish, sometimes reflecting the oldest Swedish form of the word (lag – laki, 'law'; län – lääni , 'province'; bisp – piispa, 'bishop'; jordpäron – peruna, 'potato'), and many more survive as informal synonyms in spoken or dialectal Finnish (e.g. likka, from Swedish flicka, 'girl', usually tyttö in Finnish). Sandhi is not transcribed; the spelling of morphemes is immutable, e.g. tulen+pa/tulempa/. Tietosanakirja , 11 volumes, 1909–1922, Finnish encyclopedia. Vowel harmony is a type of long-distance assimilatory phonological process involving vowels that occurs in some languages. A vowel or vowels in a word must be members of the same class. In languages with vowel harmony, there are constraints on which vowels may be found near each other. Suffixes and prefixes will usually follow vowel harmony rules. Many agglutinative languages have vowel harmony. Unless otherwise noted, statements in this article refer to Standard Finnish, which is based on the dialect spoken in the former Häme Province in central south Finland. 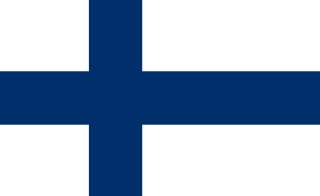 Standard Finnish is used by professional speakers, such as reporters and news presenters on television. This article deals with the grammar of the Finnish language. For the ways in which the spoken language differs from the written language, see Colloquial Finnish. Unlike the languages spoken in neighbouring countries, such as Swedish and Norwegian, which are North Germanic languages, Finnish is a Uralic language, and is typologically between fusional and agglutinative languages. The Veps language, spoken by the Vepsians, belongs to the Finnic group of the Uralic languages. Closely related to Finnish and Karelian, Veps is also written using Latin script. In phonetics, palatalization or palatization refers to a way of pronouncing a consonant in which part of the tongue is moved close to the hard palate. A consonant pronounced this way is called a palatalized consonant. Palatalized consonants have secondary articulation in the hard palate, or two places of articulation, one of which is palatal. They contrast with palatal consonants, which have palatal primary articulation. East Finnish culture and dialects are chiefly vested in the Savonians and the Karelians. There is less influence from Scandinavian and Finland-Swedish culture and language. The language is distinguished by vowel-diphthong shifts with respect to the standard language, and the use of palatalization. Epenthetic vowels are added after /l/, /h/ and sometimes /n/ in stressed syllable coda preceding a consonant, but this feature is not distinguishing, being also found commonly in most Western Finnish dialects. In phonetics and phonology, gemination, or consonant lengthening, is an articulation of a consonant for a longer period of time than that of a single instance of the same type of consonant. It is distinct from stress. Gemination literally means "twinning" and comes from the same Latin root as "Gemini". Consonant gradation is a type of consonant mutation in which consonants alternate between various "grades". It is typical of Uralic languages such as Finnish, Estonian, Northern Sámi, and the Samoyed language Nganasan. Of the Finnic languages, Votic is known for its extensive set of gradation patterns. Consonant gradation in some of these languages is not purely phonological although it may be surmised for various reconstructions of Proto-Finnic. In archiphonemic terms, the mutation is a type of lenition in which there are quantitative as well as qualitative alternations. In linguistics, a chroneme is a basic, theoretical unit of sound that can distinguish words by duration only of a vowel or consonant. The noun chroneme is derived from Greek χρόνος, and the suffixed -eme, which is analogous to the -eme in phoneme or morpheme. However, the term does not have wide currency and may be unknown even to phonologists who work on languages claimed to have chronemes. Proto-Uralic is the reconstructed language ancestral to the Uralic language family. The language was originally spoken in a small area in about 7000–2000 BCE, and expanded to give differentiated protolanguages. The exact location of the area or Urheimat is not known, and various strongly differing proposals have been advocated, but the vicinity of the Ural Mountains is usually assumed. Khanty, previously known as Ostyak, is the language of the Khanty people. It is spoken in Khanty–Mansi and Yamalo-Nenets autonomous okrugs as well as in Aleksandrovsky and Kargosoksky districts of Tomsk Oblast in Russia. According to the 1994 Salminen and Janhunen study, there were 12,000 Khanty-speaking people in Russia. The Peräpohjola dialects are forms of Finnish spoken in Lapland in Finland, Sweden, and Norway. The dialect group belongs to the Western Finnish dialects and it is divided into five more specific dialect groups. Konkani is a southern Indo-Aryan language belonging to the Indo-European family of languages spoken in the Konkan coast of India. It has approximately 3.6 million speakers. The Proto-Samic language is the hypothetical, reconstructed common ancestor of the Sami languages. It is a descendant of the Proto-Uralic language. Proto-Finnic or Proto-Baltic-Finnic is the common ancestor of the Finnic languages, which include the national languages Finnish and Estonian. Proto-Finnic is not attested in any texts, but has been reconstructed by linguists. Proto-Finnic is itself descended ultimately from Proto-Uralic. ↑ О государственной поддержке карельского, вепсского и финского языков в Республике Карелия (in Russian). Gov.karelia.ru. Retrieved 2011-12-06. ↑ Hammarström, Harald; Forkel, Robert; Haspelmath, Martin, eds. (2017). "Finnish". Glottolog 3.0 . Jena, Germany: Max Planck Institute for the Science of Human History. ↑ "Who's afraid of Finnish?". thisisFINLAND. 28 April 2009. ↑ "Defense Language Institute" (PDF). Archived from the original (PDF) on March 19, 2012. Retrieved 2011-12-06. 1 2 3 Statistics Finland. 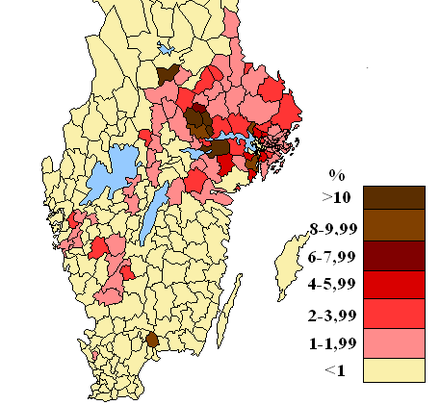 "Tilastokeskus – Population". Stat.fi. Retrieved 2011-12-17. ↑ "Ethnic nationality. Mother tongue and command of foreign languages. Dialects". pub.stat.ee. Retrieved 2018-03-07. ↑ Konvention mellan Sverige, Danmark, Finland, Island och Norge om nordiska medborgares rätt att använda sitt eget språk i annat nordiskt land Archived 2007-04-18 at the Wayback Machine , Nordic Council website. Retrieved on April 25, 2007. ↑ 20th anniversary of the Nordic Language Convention, Nordic news, February 22, 2007. Retrieved on April 25, 2007. ↑ "Sweden's Finns fear minority language rights are under threat". The Guardian. Retrieved 2018-03-13. ↑ Laakso, Johanna (November 2000). "Omasta ja vieraasta rakentuminen". Archived from the original on 2007-08-26. Retrieved 2007-09-22. Recent research (Sammallahti 1977, Terho Itkonen 1983, Viitso 1985, 2000 etc., Koponen 1991, Salminen 1998 etc.) operates with three or more hypothetical Proto-Finnic proto-dialects and considers the evolution of present-day Finnic languages (partly) as a result of interference and amalgamation of (proto-)dialects. ↑ Wulff, Christine. "Zwei Finnische Sätze aus dem 15. Jahrhundert". Ural-Altaische Jahrbücher NF Bd. 2 (in German): 90–98. ↑ "Kielen aika Valtionhallinnon 200-vuotisnäyttelystä Kotimaisten kielten tutkimuskeskuksessa" (PDF). Kotus.fi. 2 October 2009. Retrieved 29 December 2017. ↑ "Svenskfinland.fi". Svenskfinland.fi. Archived from the original on 2014-02-02. Retrieved 2012-04-05. ↑ "Kansallinen identiteetti Ruotsissa ja Suomessa 1600–1700-luvuilla näkymä". journal.fi (in Finnish). Retrieved 2018-03-07. ↑ Rekunen, Jorma; Yli-Luukko, Eeva; Jaakko Yli-Paavola (2007-03-19). "Eurajoen murre". Kauden murre (online publication: samples of Finnish dialects) (in Finnish). Kotus (The Research Institute for the Languages of Finland). Retrieved 2007-07-11. "θ on sama äänne kuin th englannin sanassa thing. ð sama äänne kuin th englannin sanassa this. ↑ Kuusi, Matti; Anttonen Pertti (1985). Kalevala-lipas. SKS, Finnish Literature Society. ISBN 951-717-380-6. 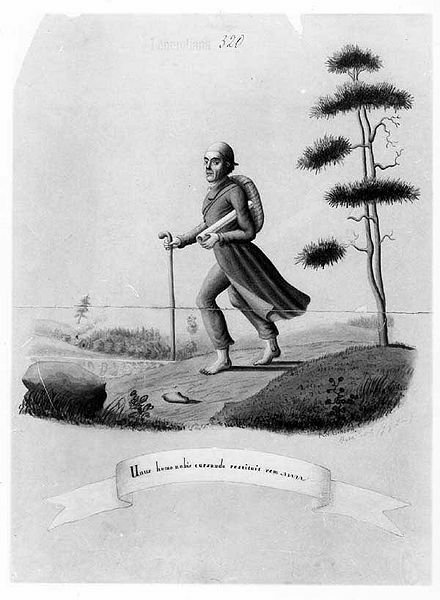 ↑ "Suomen murteet". Archived from the original on 2007-09-27. Retrieved 2008-01-03. ↑ "WALS". WALS Database. Retrieved 1 October 2018. ↑ Kirmse, U; Ylinen, S; Tervaniemi, M; Vainio, M; Schröger, E; Jacobsen, T (2008). "Modulation of the mismatch negativity (MMN) to vowel duration changes in native speakers of Finnish and German as a result of language experience". International Journal of Psychophysiology. 67 (2): 131–143. doi:10.1016/j.ijpsycho.2007.10.012. ↑ Yli-Vakkuri, Valma (1976). "Onko suomen kielen astevaihtelu epäproduktiivinen jäänne?" (PDF). Sananjalka. Suomen kielen seura (18). ↑ Häkkinen, Kaisa. Suomalaisten esihistoria kielitieteen valossa ( ISBN 951-717-855-7). Suomalaisen kirjallisuuden seura 1996. See pages 166 and 173. ↑ "Kirjaimet š ja ž suomen kielenoikeinkirjoituksessa". KOTUS. 1998. Retrieved 2014-06-29. Karlsson, Fred (2018). Finnish - A Comprehensive Grammar. London and New York: Routledge. ISBN 978-1-138-82104-0.